« Jerusalem Plaza Hotel, Mehadrin Jerusalem Rabbinate, Rabbinate Meat & More. Kashrut inspectors who arrived without prior notification at Boris’ Bakery (123 Livinsky Street, Tel Aviv), found labels for other products, “Borris’ specialties” and “Tuvlia’s specialties”, both claiming kashrut supervision from the Tel Aviv-Jaffa Rabbinate. It has been learned the items do not have any kosher supervision whatsoever. One should not buy anything from this company. (See accompanying photo is original documents below, item 1 on the left side). The above mentioned product manufactured by the Nutra Company in the United States is represented as kosher/parve with a Triangle K (USA) and authorization from the Chief Rabbinate of Israel. The Chief Rabbinate has never granted authorization to import the item. (See accompanying photo is original documents below, item 3 on the right side). The above mentioned food supplement manufactured by R.P. Shrar LTD, Germany, imported by Super Medic Light LTD, Haifa, does not have any kosher certification despite the label stating under the supervision of Rabbi M. Levinger, Basil, Switzerland. It was also not authorized for import by the Chief Rabbinate as stated. There are genuine fears regarding the source of the fish oil used in the product. (See accompanying photo is original documents below, item 4 on the left side). One of the criteria set forth by the Chief Rabbinate of Israel for tuna being imported to Israel is that it is manufactured in the presence of a mashgiach to avoid a number of concerns, including bishul akum and non-kosher fish accidentally finding their way into the tuna marked as kosher. It is pointed out that there are kashrut agencies abroad that do not demand the presence of a mashgiach during the manufacture of tuna and rely on halachic rulings permitting such action. They also permit bishul akum, these decisions in accordance to their considerations for their constituents. As such, Jamco white albacore tuna chunks in oil (barcode 7290006884145) with an OU hechsher, as well as Pillar Rock pink salmon (barcode 7303010314) with an OU, and Iltit Varuda (uncertain of product by Hebrew name) (barcode 7290012019388) with an OU, are all unapproved by the Chief Rabbinate of Israel. Therefore they are not permitted in any place with a Rabbinate supervision and must be returned to supplier immediately. (See accompanying photo is original documents below, item 5 on the left and right sides). Acting on a complaint, it was learned that a new branch of Beit HaShwarma was opened at 62 Herzl Street in Lod [in the former Bank Hapoalim]. The store advertises kosher under the local rabbinate, with two mashgichim. In actuality, the store has no supervision at all. The Gilboa Region Rabbinate has revoked its kashrut certification from the caterer operating under the name Timun Ta’am Chavaya Pinuk, under the management of Yaron Cohen, Kibbutz Tel Yosef. The rabbinate no longer accepts responsibility for the firm’s kashrut and therefore, it is prohibited for use to conduct weddings. **100% Katit Olive Oil (4 liter containers), distributed by TAAM Zayit LTD, manufacture date 8/2009. They contain other oils in addition to olive oil. Buyer beware. (See accompanying photo is original documents below, item 8 on the right side). Importer Pe’er Meats & Fowl LTD has imported Zahavon (Coalfish / Saithe) fish covered in ice (80% fish) manufactured in China. 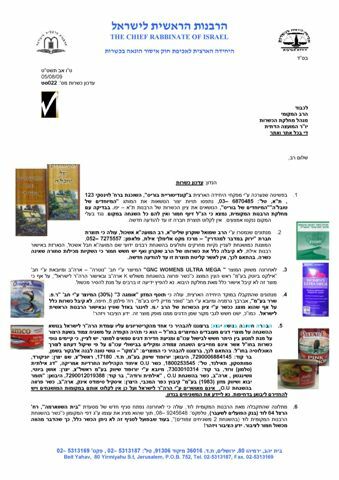 It is labeled kosher parve, under the supervision of Rabbi Netanel Meudad, Hong Kong and with import permission from the Chief Rabbinate of Israel. The fish has no kashrut supervision. Ta’am V’Reiach Restaurant located at the entrance of Moshav Ein Yaakov displays a Mehadrin kashrut certificate from the Mor Levana kashrut agency, one that is not authorized or recognized by the Chief Rabbinate of Israel. (See accompanying photo is original documents below, item 10 on the left side). The kashrut of Mizrachit HaK’shera Restaurant, the City Center Building, first floor, 6 Ben-Gurion Blvd was revoked due to serious kashrut violations. In one serious incident, in which a mashgiach was assaulted, police assistance was required. 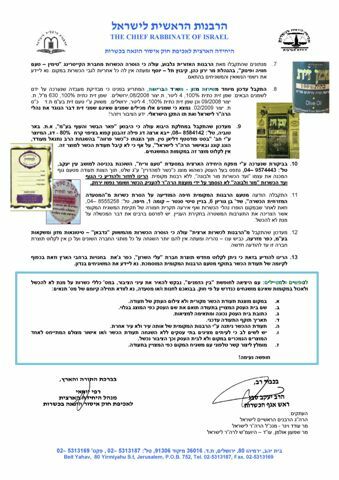 The Gedbon Food and Drinks Distributor LTD located in Kfar Mazara lost its kosher certification and their products should not be used. The shrubbery from Alei HaSharon may once again be used after proper arrangements for kosher certification were made. 1. If you are traveling, a photocopy of a kashrut certificate is invalid. 2. The store name on the sign must match the name of kashrut certificate. 5. The local rabbinate certifying agency must be the rabbinate of that city, not from another city. 6. At times, stores without a kashrut certification will display certificates pertaining to sealed items they sell, but that does not cover the store. 7. One is advised to make phone contact with the mashgiach whose name and number appear on the certificate to validate legitimacy. His document presents the actual facts from the Hebrew original but is not a literal translation. Posted on August 5, 2009 by JKN Israel. This entry was posted in 5769 - 2008/2009, Chief Rabbinate Updates. Bookmark the permalink.